She looks at totodile mid air..."Sawsbuck fire an energy ball through the water gun" she says ..."!!SAWSSS!!!" it yells as it charges the move and fires it as it traveled up the waterguns path slowly due to the resistance but it made it way to totodile. 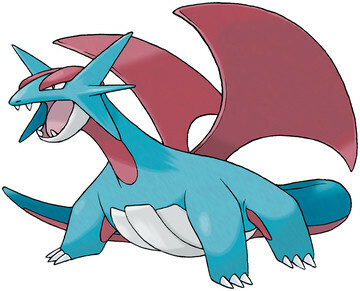 Totodile’s eyes glow a bright red, and then so does Sawsbuck, causing Sawsbuck’s defense to decrease. Cabella smiles as she adds, “Then move in with Scratch!” And Totodile charges at full speed, claws glowing white. But before Totodile could strike, it is knocked aside by an invisible force. Cabella gasps, “Totodile!” And turns her head to look at a young man who had not been there before. “This fight was too sad and boring to watch.” The person gives a dragged out sigh, arms folded over chest. “Says me.” He replies with a snort. “And you are?” Cabella arches a brow. Cabella glares at him and snarls. He makes his way up to Cabella and lifts her chin up before chuckling, "I'll admit, you're cute when you're angry." He smirks. With that, the young man and the Salamence vanish. Cabella stands, blinking repeatedly, staring at where they had been. She looks at Totodile and whispers, “Are you okay?” Totodile nods twice. Cabella keeps her head down for a moment before clearing her throat. “We should eat before the food gets cold! And then let’s continue our battle!” She smiles brightly. Erika looks at the spot where the mystery boy was just present...."be careful cabella only strong trainer's can tame a Salamence" she says as she turns back to the food. Voss came to eat just in time to hear Erika's challenge. ..."Your a gym leader for grass type pokemon you have an advantage over her totodile" he noted as he smiled over a plate Erika couldn't help but giggle as she said " just want to send Cabella forward on her journey with as much knowledge as possible"
Erika looks at Voss and winks "dont be disappointed i see great things in you as you and Cabella seem like opposite pieces of a puzzle....fire and metal together you guys can create a better substance you understand and besides i bet that you have a lot of potential and brain power mr doctor did i mention your very handsome also"
Erika is on one side of the field and Cabella on the other..
Cabella grins as she releases Starly. The bird pokemon soars high up to the clouds and then dives back down. Before striking the earth, Starly spreads its wings and hovers and twirls. Cabella laughs, “Show off.” She shakes her head. Starly flaps its wings and looks at Breloom, ready for Cabella to give a command. “Alright Starly, use Wing Attack!” Cabella calls out. Starly charges towards Breloom with wings out wide, and glowing. Totodile is beside Voss, cheering Starly on. Erika looks on... "OK Breloom hold your ground" she says as the wing attack hits Breloom head on. Erika smiles... "Cabella this is what I wanted to..., even if you have a type advantage doesn't mean you should recklessly attack. From how you battled with totodile it seems your a head on battler and now with starly I can see that but never underestimate how a pokemon was raised my breloom's stamina is extremely high. She says as breloom is holding onto starly despite the pain. Cabella watched in complete awe, but gasps as Starly faints. She stares for a moment, and then returns her pokemon. “We’ll be more careful next time. . .” She whispers before putting the pokeball away. Totodile rushes over to Cabella and leaps onto her back, and she laughs. Cabella looks at Erika and grins. “I thank you greatly for the battle. Even if I lost, it was a lot of fun!” She beams, her joy practically radiating. “I learned a lot, and I’ll be sure to keep it all in mind.” She nods, fixing her hat and then patting a happy Totodile on the head. She turns her head to look at the sky. It was getting dark. Cabella turns her attention towards Voss. “Alright, we should really keep a move on. Let’s keep going until that sun is completely down! And then we can build camp!” She throws a fist into the air, grinning. Totodile does the same. Cabella walks over to Erika and shakes her hand. “It was an honor to meet you Erika! And we’ll still keep our eye out for any poachers while we’re on this journey! And we’ll make sure to teach em a lesson!” She laughs. He was surprised at seeing Starly lose with such an advantage. Cabella turns towards Voss and puts her arm through the nook of his, hooking them together. She smiles brightly at him and nods, “Yup! Let’s get a move on!” She firmly states, and starts to pull him with her as she walks forward. She waves back at Erika and shouts, “I’ll keep that in mind! But don’t worry about me! The next time I see that boy he won’t know what him instead!” She flashes a wide grin. She hums to herself as they disappear into the thick of the forest once more, Erika now just a figure hidden behind the foliage somewhere. Cabella looks at Voss and laughs, “The look on your face when Starly was taken down was priceless.” She snickers, her arm still hooked to his. Totodile almost glares at Voss, as if jealous. He continues to walk and blushes as Cabella had grabbed him. “Hey, I just started this whole pokemon business today. I’m not going to be perfect right off the bat. I’ll understand more as I go.” Cabella shrugs, smiling up at Voss. “And don’t say that. If anything, you seem to know more than I do.” She lightly laughs, arching a brow. “Busy doing WHAT! ?” Her mother roars. “BYYYYE.” Cabella says before she hangs up, and puts her phone away. She looks at Voss and shakes her head. “Overprotective mothers. What chya gonna do?” She snickers. Then, Cabella yawns, and soon after Totodile does the same. “FIRST. We sleep. I’m only human! I need rest. And so do my pokemon. I mean, Starly still needs to be healed.” Cabella gestures towards the moon and the stars that now hang in the sky, and then towards Totodile and her bag. “So how about we find a place to stay, hm?” She arches a brow. But, she doesn’t even give Voss a chance to answer as she starts to walk, dragging him with her. Cabella continues walking until she steps out of the forest and onto a real pathway, and into Cocoon City. She would take pictures of the city tomorrow, but right now she charges towards a pokemon center. This one was larger than the one she had been to with her father. Then again, city ones would be expected to be such. The two are welcomed by a Nurse Joy, whom Cabella gives her pokeball that contains Starly to, and then asks if they would be allowed to stay. Nurse Joy explains that there are rooms for trainers to stay in on the upper floors. With a thanks, Cabella makes her way up the stairs. "Well yea that was obvious I just was saying what our next move was" he says as he then walks to the men only section of the Pokémon Center. Cabella had made every attempt to sleep. But she couldn’t. She thought she would be able to handle things perfectly fine away from home. But it seemed like this first night was going to be difficult. She sits up in bed and glances over at Totodile, who is sound asleep at her feet. She crawls out of the bed and tiptoes her way out of the room. Cabella quietly makes her way through the hall, and to the male rooms. She glances from left to right, hoping that some guy wouldn’t spot her. She finds the room Voss had chosen, and knocks on the door, once more cautiously looking around. Voss wakes up and goes to the door tired as he rubs his eyes his vision clears and he see's Cabella. "Cabella...what are you....CABELLA!!" he then shouts out in surprise when he notices where she is but then quiets down. Cabella shuffles her feet, her head somewhat bowed as she puffs her cheeks out. She felt more than embarassed. “This is going to sound weird. Really weird. But can I please sleep with you? I mean, not like that! But like in the same room? I can sleep on the floor!” She takes another quick look around before looking up at Voss. “I can’t sleep.” She sighs. She didn’t want to tell him that she was scared. And homesick. "Oh dear lord, fine just don't tell your mother please my eardrums are still ringing and nonsense you take the bed i'll sleep on the floor" he says as he lets her inside. “NO! I am sleeping on the floor!” Cabella shakes her head, her tone as scolding as it could possibly get. “This is your room.” She huffs, folding her arms over her chest as she stomps her way towards the bathroom. She rummages through her bag – as she had brought it with just in case (she really didn’t need Totodile to steal any of her snacks). "Duskull, Elekid come out" he says as they emerge from their pokeballs. Elekid threw its fist in the air. Duskull looked scared as it said nothing. ..duskull wasn't brave at all he was domesticated not raised for battling mainly to assist not fight. Cabella angrily mutters to herself as she exits the bathroom, and looks at the Elekid and Duskull. She smiles brightly and claps her hands together, “Wow! I knew you had pokemon!” She laughs before walking over. What she was wearing was a bit revealing, and it showed off her slim figure quite well. If her mother knew that she had been traveling with a boy with short shorts and a camisole as pajamas. . . she would be dead. “We’ll have to battle tomorrow! Before we get to any sort of gym!” Cabella gasps, her eyes widening with joy at the thought of battling Voss. Cabella thinks for a moment, looking from Elekid to Duskull. She makes a sort of pouting face, upset that they wouldn’t get to battle. She would make sure they do at some point. Voss regains his composure.., "Well I guess your not at fault for having packed what you had packed" he says finishing his check up on his pokemon. “Yup! Ready!” Cabella beams. She shoves Voss off the bed on the floor and lays down. “Like I said, this is your room so you get the bed.” She tells him. “I’ll be perfectly fine on the floor~” She chimes. A sore back in the morning isn’t something that would slow Cabella down. Cabella glares at Voss before she gets up and grabs his arm. And in one swift motion, she lifts him up off the floor, flips him over her shoulder, and causes his back to slam onto the bed. She points at him as a way of telling him to stay, and then she crawls into the bed with him. “There. We can share. Now go to bed.” She grumbles. Cabella reaches out and grabs him and pulls him back down, her arms wound tightly round him. “I am not letting you sleep on the floor. And the more you try to struggle the closer I am bringing you!” Cabella confirms, her tone threatening. Voss decides to listen as he lays down and then goes to sleep. It is awkward for him though he never slept in the same bed as a girl before.